That’s one quote you probably don’t need to be a Disney buff to remember. And there’s one even Disney buffs might not have heard. Both were uttered by Mr. Walt Disney in regards to the dedication of his Disneyland theme park in July, 1955. The first embodied Walt’s starry-eyed vision for the place. The second, his sheer practicality. Like any other red-blooded American dad, I’m a huge fan of Disney (select aspects of it anyway– I don’t care for its modern teeny-bopper fluff). More accurately, I’m a huge fan of Disneyana. I love Disney’s old-school classic movies and Pixar’s new-school masterpieces, too. I love the origins, the vision, the theme parks and the philosopies that inspired them. I find the history of the theme parks especially fascinating. Disneyland, in particular. If you’ve ever taken your kids to Disneyland, you’ll probably agree that once you get your head past the cost of admission and the annoyances of the crowds, it’s a pretty magical place. July 17, 1955 is a big deal in theme park history. In just over a year, Walt Disney had transformed a non-descript orange grove into a 160 acre wonderland. The dedication was attended by throngs of reporters, celebrities, and movie stars. ABC broadcast the event live. It was magical. It was also a disaster. At work today, an Air Force color guard retired four United States flags in honor of Flag Day. Watching a flag retirement always touches my heart. If you’ve ever participated or watched this ceremony before, you know how I feel. I returned to my cubicle with a full heart and clothes that smelled like campfire smoke. I’m at once amused and fascinated by the matter of George Washington’s overdue library books. Amused because, after all, Washington sewed seeds that changed the world. Men of his honor and caliber rarely grace the history pages. Considering the political scandals of present, it’s fun to look back on trivialities of the past. My fascination with this story is based less on the historical facts themselves and more on the process of connecting the jigsaw puzzle. I hated history in high school (no offense, Mr. Madsen) because the work had been done for me. My grade depended on memorization and regurgitation, not investigation. I wonder how many kids who think they hate history would realize they actually love it if their teachers thought outside the textbook. My post about Washington’s library books last week was supposed to be a simple Friday blurb about an interesting historical factoid (a great date night conversation piece!). But the more I researched this story, the more questions arose. Not big conspiratorial questions– just curious questions about the timeline and some inconsistencies in the press reports. Some news reports had mentioned two books, others mentioned only one. Beyond this, I wished somebody had taken time to flesh the story out a little more. In 1789, the U.S. government was based out of Federal Hall at Wall and Broad Streets in Lower Manhattan. 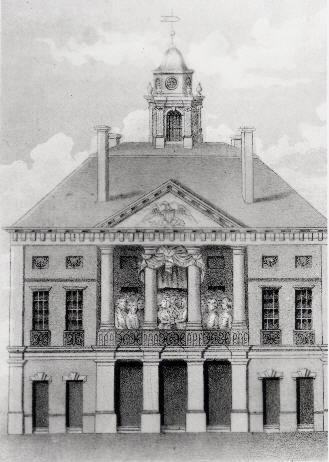 Occupying the top floor of the building was the New York Society Library, which was founded in 1754. The library was a useful resource for government officials and it was frequented by the likes of Alexander Hamilton, Aaron Burr, John Jay, and sometimes the president himself. By fall of 1789, Congress was in recess and the president was preparing to tackle the touchy issue of diplomatic affairs with Britain. In fact, he’d be meeting with Chief Justice John Jay and Treasury Secretary Alexander Hamilton about these matters on October 7. Given these circumstances, it’s no surprise that Washington would check out library material on British parliamentary dealings and international diplomacy. October 15, 1789: Washington leaves New York for a tour of New England. Though he keeps a detailed diary, no mention of the books is made. November 2, 1789: The books are due, but Washington is fishing for cod off of New Hampshire’s Portsmouth Harbour. Washington notes in his diary that he and his companions only caught two fish between them. Then, in true fisherman tradition, he justifies the skunking by blaming an improper tide. The library books are likely the last things on his mind. Though no official fine record exists, a pennies-per-day fine would begin accruing after this date. April 1792: The 18 lb. ledger is filled and is filed away. It is later misplaced– likely during one of the library’s re-locations. Dec. 14, 1799: George Washington dies at Mount Vernon. Most of his belongings, including books, are divided up among his family. 1934: NYSL staff rediscover the deteriorating ledger in the basement of the library’s fourth Manhattan location. The ledger’s pages crumble to the touch, so it is used only rarely for reference until the beginning of its restoration in 2007. NYSL staffer Sara Holliday suspects that the Washington transaction was noticed sometime after the ledger was found, as it had been discussed unofficially and anecdotally among library staff for years. 2007: NYSL begins restoring and digitizing the ledger. 2010: Restoration complete, NYSL staff check their inventory again. Washington’s books are still missing. The New York Daily news picks up on the Washington transaction and breaks the story. The fine estimate of $300,000, according to Holliday, was calculated by the Daily News, not the NYSL. She says fine policies changed over time, and that an exact total would be tough to determine. Anyway, it’s something the NYSL has no interest in tracking. Upon hearing about the overdue books, staff at Mount Vernon search their own archives with no luck. 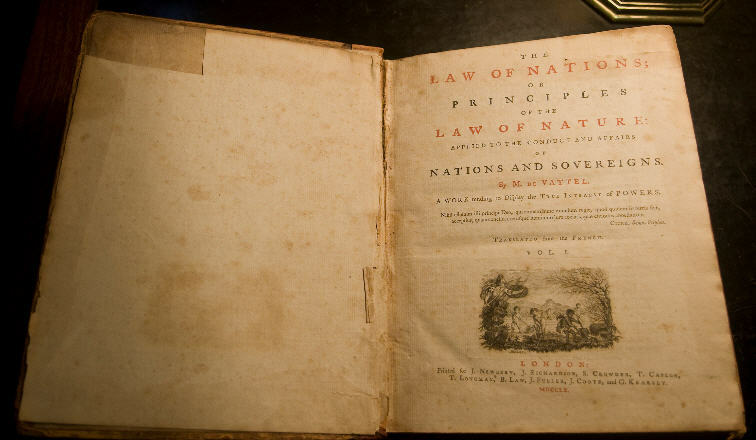 Considering The Law of Nations the much more significant of the two books, they purchase an identical copy online for an undisclosed amount (I’m told the price reported by one outlet and echoed in several others is inaccurate). May 19, 2010: In a ceremony at NYSL, Mount Vernon President James Rees and Librarian Joan Stahl present the replaced book. Most media reports focus only on the return of The Law of Nations, making no mention of the still missing Commons Debates. Holliday says restoring the ledger familiarized NYSL staff with habits of their 18th Century counterparts. Patrons from the Federal government were commonly referred to by their titles, which is why the informal “President” appears next to Washington’s checkouts in the images below. Exhibit A: the portion of NYSL's charging ledger that shows the Washington transaction. I've highlighted the relevant rows. Exhibit A.1: The same portion of the ledger, but I've identified the columns. Washington is off the hook– at least for The Law of Nations. And that’s where the media called it good and skipped out. But the father of our country still has one overdue book out, and though history has certainly forgiven this oversight, it’s going to drive me nuts until somebody finds it. Maybe it’s time to book a trip back east! Copyright 2010 BonnevilleMariner.com. All images courtesy of the New York Society Library. Special thanks to the NYSL‘s Sara Holliday and Mount Vernon‘s Melissa Wood and Joan Stahl.